StageBuzz.com: Planet Connections Interview - Rick Leidenfrost-Wilson of "The Declaration"
Planet Connections Interview - Rick Leidenfrost-Wilson of "The Declaration"
My mother died when I was fifteen. Some friends of mine needed me to play piano, all of a sudden, for some back stage “pre-show” music - madgrigals, ballads, show songs. The show was A Company of Wayward Saints. O’Neill, Shepard and Sara Ruhl. The Declaration is about a gay, high school teacher who runs for the New York Senate because he’s outraged that the Senate voted against marriage equality. 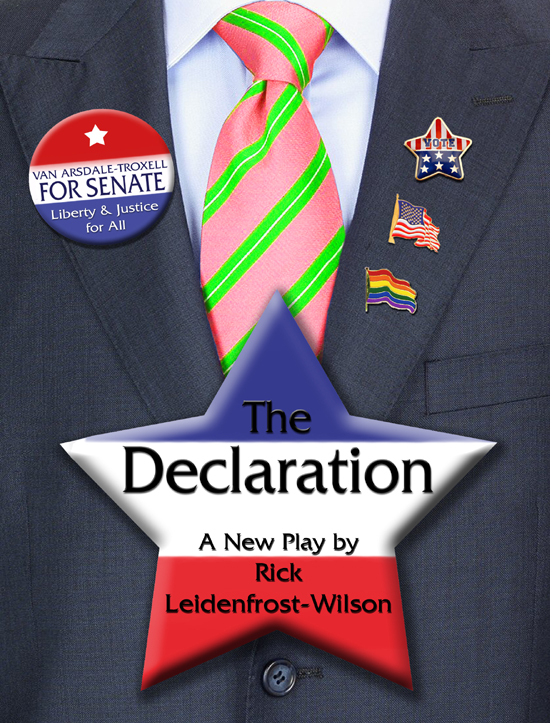 The show follows the political and personal journeys he undergoes over his year campaigning. I was outraged – hurt to the core, really – that the representatives of my state, which I’ve called home for over twenty years, decided that my marriage and thousands of other marriages across New York were not worthy of recognition. From January to March of 2010 I actually mounted a campaign for the Senate myself; so the story is somewhat inspired by that as well (although the characters and story lines are fictitious). We’ve chosen Marriage Equality New York because they are timely, front-line soldiers in this war, right now, and we want to recruit as many as possible for their cause. And finally, if your play was food, what kind of food would it be? Or if you'd prefer something a little less oddly whimsical - If you could get any person, living or dead, to see this show who would you choose and why? Well, I’ll give you both! Hands down, the show would be pasta puttanesca. The show features 12 actors who play a wide spectrum of very different characters which come together and work in delicious, theatrical harmony. I wish Harvey Milk was still alive and able to see this show. He was a groundbreaking figure for the LGBT movement in politics. The tragedy that took his life is a figurehead of the problems that LGBT Americans face everyday, but also a reminder of how far we have come as a community. I know if Mr. Milk was alive today, he’d be on the front lines of the Marriage Equality battle, and that is what “The Declaration” is all about.